Watch out Fiji Airways, there is a new boutique airline vying for the attention of the Pacific. Hawaiian Airlines today revealed their plans to install a brand new lie-flat first class (or International business class) product that matches international business class standards. We are thrilled, as finally Hawaiian have concreted their position as the true owner of the Pacific market. Entering the skies in 2016, the new ‘Premium Cabin’ product will offer 18 customers on each of their A330’s a new level of comfort. 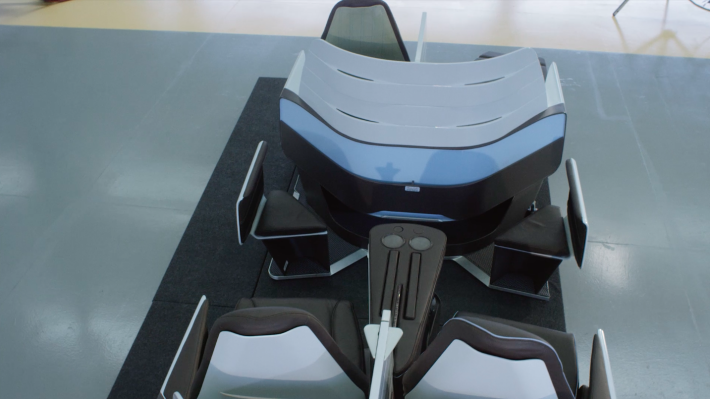 The 180-degree lie-flat seats were developed in partnership with Hawaiian Airlines by Optimares, an Italian manufacturer focused on traveler-centric design. The 3 rows of seats, configured in a ‘honeymoon favourite’ 2 x 2 x 2 layout will convert into 76″ long (6’4″) beds which will not only allow passengers travelling together to enjoy themselves, but with the clever inclusion of a retractable privacy screen, also offer passengers travelling alone, a modicum of privacy too. Whilst not all passengers will benefit from all-aisle access, the seats are light-years ahead of their current recliner-style seats and the space between each seat is ample enough to be able to step over your partner if situated in a window seat. Unlike the awkward static screens found in some carriers, that making watching TV in bed virtually impossible, Hawaiian have opted for an advanced in-flight entertainment experience powered by the next generation of large-format tablets and equipped with a telescoping tablet arm that adjusts to optimize viewing angle and comfort. Hawaiian worked with West Coast-based brand and design consultancy PaulWylde (the same team that improved Hawaiian’s 717 fleet) to translate the airline’s signature design language, rooted in the natural colors and forms of the island landscape, into the cabin experience. The cabin design will incorporate flowing curves evocative of the winds and ocean, while marrying organic textures, pops of bright saturated color, and luxury materials like leather from Poltrona Frau. We have to agree, Paul Wylde has perfectly managed to balance both comfort and Hawaiian style to create a really boutique experience that is expected of such a carrier. The seat design feels unique, and the design touches, such as bamboo privacy screen, contrast stitching or the wave pattern seat back add a sense of individuality, which Hawaiian can proudly boast in a sea of otherwise boring leather seats that grace the pacific skies headed to the islands. Whilst the airline’s main competitors for comfort include United and America, the new contender to the market place – Virgin America – which was perhaps seen as the most stylish way to get there, now has to fight hard against the biggest and best carrier to and from Hawaii. Although the first aircraft will come to the islands mid next year (we can’t wait!!) the remaining 22 A330 aircraft will have their products installed in waves between September of 2016 through 2017. But as for those not able to enjoy the new first class seats, there is more good news. 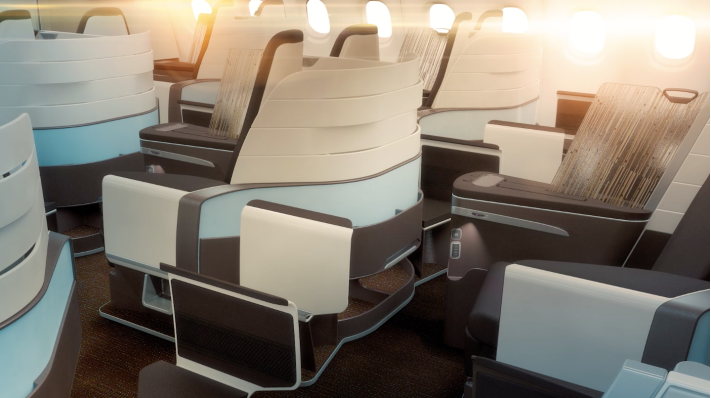 As part of the cabin redesign, Hawaiian also announced it will add 28 additional Extra Comfort seats on each A330 aircraft in response to growing demand for its popular premium economy service. The Extra Comfort option features 36 inches of seat pitch; priority boarding at the gate; complimentary on-demand in-seat entertainment; and a personal power outlet. That means that the aircraft will have their seat count reduced from 294 passengers, down to 278, with no reduction in the 31″ economy class seat pitch. As for the routes these new seats will fly, it’s sadly a game of pot-luck to start with, as Hawaiian operates its A330 aircraft on the majority of its North American and international routes. Adding to the enjoyment of the travel experience is the carrier’s signature onboard hospitality program, Mea Ho‘okipa (translation: I am host). Travellers are treated to island-inspired complimentary meals and made-in-Hawai‘i snacks to go along with the airline’s engaging presentation of the islands’ culture, people and Aloha Spirit throughout the flight. And as for amenities, although the carrier has hinted at further improvements to its amenity offering, these will be revealed at a later stage. Mahalo and well done Hawaiian on a fantastic job in offering passengers what they really want when travelling to the islands.